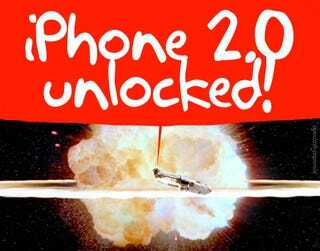 The new iPhone OS 2.0 software has been unlocked and jailbroken. It was released just hours ago and it has already been cracked by the iPhone Dev Team. The first one took a couple of months, but this one was actually unlocked before Apple released it to the public. And you have had the proof in front of you all morning. Updated with link to iPhone 2.0 unlock. You can download from here and here. If you were wondering how I was doing push email tests on iPhone OS 2.0 and Vodafone UK, this is the reason why. The code wizard commandos at the iPhone Dev Team have been working on this non-stop since the early days of beta testing. In fact, I had iPhone OS 2.0 running on my iPhone since last week. That was version 5A345, two below 5A347, but identical in functionality. Now that the official iPhone OS 2.0 is out, the iPhone Dev Team will release their Pwnage tool for everyone to unlock and jailbreak their iPhones soon, although the specific date/time is not firm yet. It may not be as interesting as before-since most countries now have the iPhone and it will be impossible to buy without doing a contract first-but people looking to install unsigned applications and buy pay-as-you-go cards while traveling-instead of roaming-will find it very useful.